‘What is it?’ I said, standing on the lip. I lowered myself down. In an oven tray he had collected pieces of coloured pottery, a clear bottle with a marble in its neck, a broken ceramic pot stamped with ‘Bloater Paste’. I picked out the edge of a plate, licked my thumb and rubbed until the pink glaze on a dinner service appeared. ‘One man’s rubbish…’ I started. ‘On top.’ He rattled the tray. I looked again and saw a smooth brown stick, jagged at one end. ‘Human,’ he said. 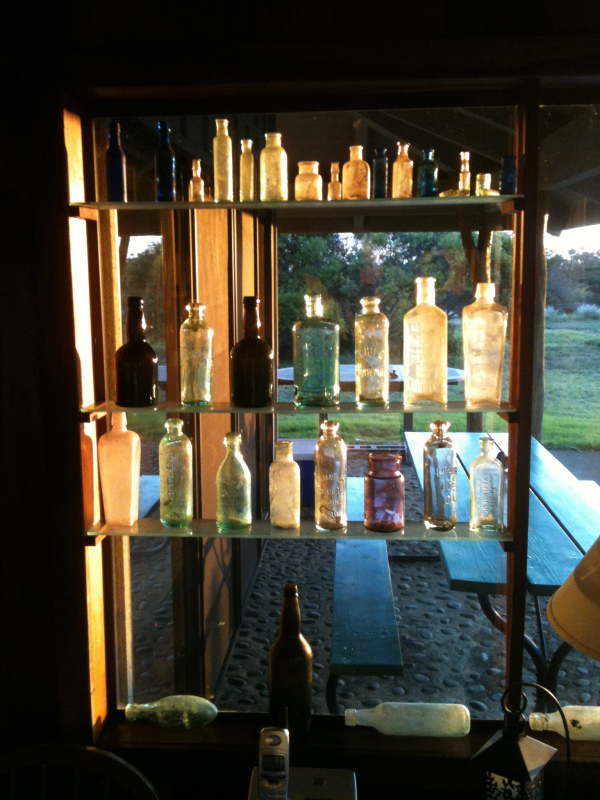 This is a Friday Fictioneers story. 100 (or so) writers writing 100-words (or so) inspired by the picture above (supplied this week by G.L.MacMillan.) Join in or read some more stories. My novel, Our Endless Numbered Days, has been longlisted for The Guardian’s ‘Not The Booker’ prize. The next stage of the competition is a public vote. So, if you’ve read my book and liked it, it would be great if you could vote for it here. You need to choose two books from the longlist and write which two you’re voting for in the comments section, including a short review about one of them. Thank you in advance! Bloater paste… was it really very salty? Or am I confusing it with anchovy? Either way, the bone collector seems to be enjoying himself. Nice take on the prompt. Oh, I LOVE that book. I re-read it with my daughter not so many years ago, and still really liked it. Think I saw him working at a garage off the Mile End Road smoking a woodbine – now there’s an old favourite! Yum yum – you obviously have a taste for archaeology Claire (and the macabre). My nephew is an archaeologist on Shetland and gets the call out for bits of bone – so far only old bits of sheep. a bit confusing for me? I guess I don’t spell everything out! The history of the world in artefacts. A Victorian mystery? Maybe. I don’t know where it was going. I enjoyed this fresh look at archaeology. Nice work. This really caught me up since I was an archaeologist for the first 15 years of my working career. These guys sound more like “grave diggers” to me. Great idea, Claire. Good story but I especially love the title! Toasted bloaters are a nautical favorite. I imagine the paste would be very salty. Beautifully written as always. This reminds me of a story I was told by a man who had been involved in steel salvage after the Gulf War. He was a civilian charged with assessing the quality of the remaining steel in the destroyed Soviet tanks used by the Republican Guard along the Road of Death from Kuwait to Iraq. He told me about walking up to a tank through a field of burned sticks. He wondered what kind of trees grew in the desert. With horror he realized that he was walking through the remains of the Iraqi soldiers accompanying the tanks, charred beyond anything recognizable as human. He was very matter-of-fact in his telling of this horror story, but I could tell that it upset him tremendously. And congrats & good luck on the longlisting! In the States we call this dumpster diving. 😉 Apt descriptions and stellar writing as always. Not heard of that term before. Thanks Rochelle. A really entertaining read; good work as always. Yep, dumpster diving! (Licking the finger then the plate. Ewwww gross). LOL! Great story! Better than the other way around! Interesting. I love the way you’ve worked the facts into the fiction. It sounds disgusting! Good luck with the book. Hah! Really? I think it sounds fascinating. Enjoyed this piece of archeological fiction… admittedly, I had to look a few things up (like Bloater paste). This week, it seems that some things don’t translate across the pond, as well as other things… you with MG, me with you… ah, Life’s translations! I really enjoyed this still; very nuanced and clever! Congrats on the continued success of the book, wow! I don’t mind that, well, from the point of view as a reader – makes me learn more stuff. The beginning of a Victorian mystery. Whose bones were thrown into the garbage? Who tried to hide the crime? I like archaeology, and rubbish pits are treasure chests. I really like archaeology too. I’ve dug in a couple of rubbish pits and they are fascinating. Interesting build up then a touch of the macabre. That was most intriguing. Clever ideas and appealing characters. And the ending is great – there are so many possible explanations. Love it. Congrats on the continuing success of your book, also.